Karla, a veteran Team Member at Ridgeview Eye Care, serves as Office Manager. Karla’s knowledge and passion for her position along with her willingness to continually strive to exceed patient expectations helps to ensure the eye care experience at Ridgeview Eye Care is second to none! 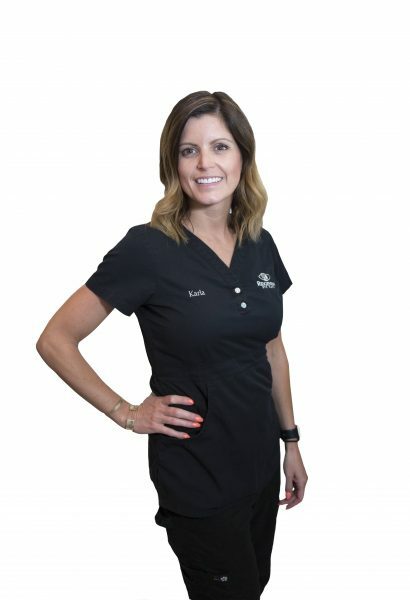 While Karla enjoys all aspects of the optometric office, she particularly enjoys getting to know each patient on a personal level which helps to create a very warm and welcoming environment. Karla, born and raised in Alton, Illinois, graduated in 2006 from the University of Missouri with a bachelor’s degree in Textile and Apparel Management. Karla was also an avid member of the Delta Gama sorority during her time at MU. Following graduation, Karla moved to the Kansas City area and then shortly after settled in the Lawrence/Eudora area where she currently lives with her husband, Dr. Jake Letourneau, and their dog, Blue. Karla spends her free time with family and friends, supporting KU at various sporting events, being very involved with her church and exercising.